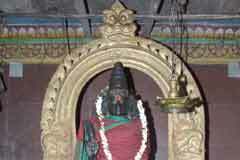 The Lord of the temple is praised by saint Gnanasambandar in his Thevaram hymns. 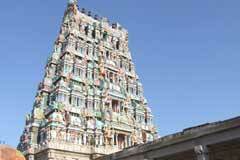 This is the 103rd Lord Shiva temples on the southern bank of Cauvery praised in Thevaram hymns. 10 day Chithirai Mother Chamundeeswari festival commencing from the first day after new moon day in April-May; Vaikasi Visakam in May-June; Aavani Moolam in August-September; Aadi Pooram in July-August; Aipasi Annabishekam in October-November; Karthikai Deepam in November-December; Margazhi Tiruvadhirai in December-January; Thai Poosam in January-February; Maha Shivrathri in February-March and Panguni Uthiram in March-April are the festivals celebrated in the temple. 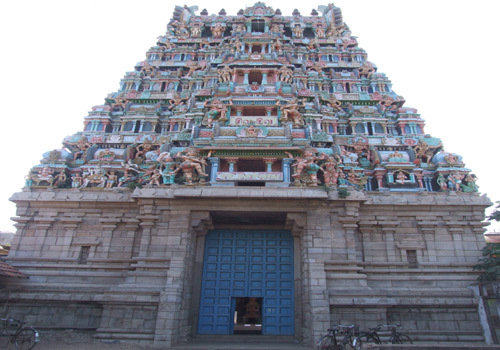 The temple is open from 6.00 a.m. to 11.30 a.m. and from 4.30 p.m. to 8.30 p.m.
Lords Vishnu, Brahmma, Vinayaka, Muruga and Indira, Sages Sukha Muni and Agasthya had worshipped Lord in this temple performing pujas. 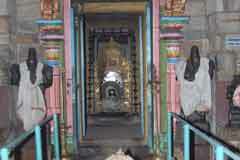 It is believed that Asthma patients would see relief if they pray in this temple. Devotees pray to Mother Chamundeeswari for solution in finance business problems, removal of delays in marriage proposals and for child boon. Those suffering rat and poisonous bites come here on Sundays, tie a root in hands and bathe in the theertham for relief. Next to Mysore, Mother Chamundeeswari in this temple only in south graces the devotees in all Her majestic form. 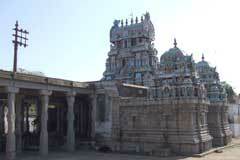 This is the 103rd Shiva temple praised in hymns on the southern bank of Cauvery. 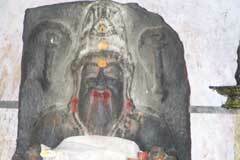 A king Vasudevan by name visited a number of Shiva temples seeking child boon. 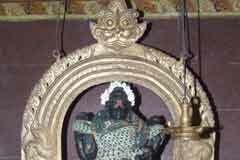 They worshipped with all devotion Lord Nellaiappar in Tirunelveli. Pleased with their prayer, Lord made Mother Parvathi to be their daughter and Mother Chamundeeswari Her nurse. When the royal couple was bathing in Tambiraparani, they found a conch floating on a lotus. When they picked up the conch, it became a child. They named the child Rajarajeswari. 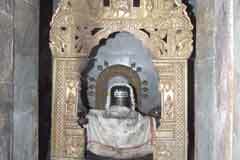 As decided by the Lord, Chamundeeswari one of the Saptha Madhas became the nurse of the child Raja Rajeswari. Rajarajeswari mastered all the arts and the Chess in particular. The king announced that the one who won his daughter in Chess would have her hand. But none could win her. The king, as advised by a sage took on a pilgrimage with his queen, daughter, her nurse Chamundeeswari and his convoy. Lord in the guise of a Siddha met the king and claimed that he was master of chess game. The king welcomed the siddha to play with his daughter. Lord in the guise of Siddha won the game and appeared in His true form granting darshan to all. The divine wedding took place with all its due pomp and splendour. 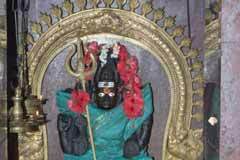 As Lord won the chess game-Chaturangam in Tamil, came to be praised as Chaturanga Vallaba Nathar. Ambica and Her nurse Chamundeeswari bless the devotees from their respective shrines. Lord joined them to stay in the place. The temple came into being. 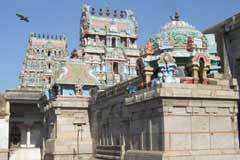 The devotee has to take the (Thanjavur) bus from Tiruvarur to reach Needamangalam. From there, he/she has to take the Mannargudi bus and get down at Poovanur. Royal Park: +91-4366-251 020 to 023.